YORKSHIRE great Geoffrey Boycott has branded Adil Rashid a “spoilt brat” who has no understanding of loyalty and is setting a poor example to young cricketers. The leg-spinner has come in for fierce criticism following his inclusion in the England Test squad for the India series, despite his self-imposed exile from first-class cricket with Yorkshire this year. Writing in the Daily Telegraph, former England and Yorkshire batsman Boycott said: “He should never have been handed a Test recall. In two years England have gone around in a circle. By picking Rashid, they are selecting the unselectable: a player who will not play four-day Championship cricket for Yorkshire because his heart is not in it, but he will play for England in Test matches. Absurd? Yes. “This is not setting the right example to our youngsters and we expect more loyalty, especially from a home-grown player. Sadly, Yorkshire did not have the balls to do that. 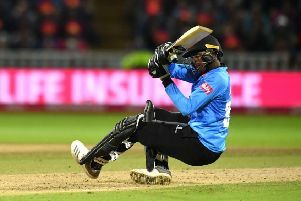 “I accept other counties would have snapped him up, but Yorkshire have put so much time, effort and money into helping this kid develop into an international cricketer. They have never stood in his way, wherever he played around the world, and he repays them by showing he could not give a t*** about the club. Boycott said Rashid reacted to Vaughan’s criticism “like a spoilt child”.